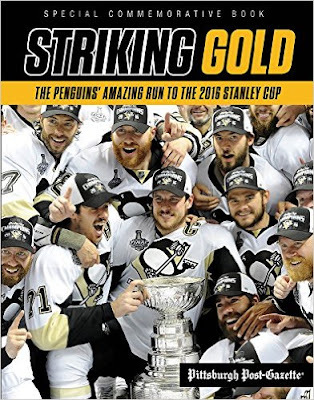 Striking Gold is a Triumph Books collaboration with the Pittsburgh Post-Gazette that tells the incredible tale of the 2015-16 +Pittsburgh Penguins . Now I'm not going to recap the brilliant rise-from-the-ashes story of this amazing season here but I am going to say without any obligation that this book is incredible and it's something I will treasure for the rest of my life. This book is a collection of Post-Gazette stories detailing the 2015-16 season. What sets this apart from the usual collectible is that the stories are preserved in the moment of time where the season was very much in jeopardy and the Penguins were in a dark place. The pictures are beautiful and captivated by son for hours as he thumbed through the pages. I can just imagine in a few years him reading back on this season and learning about all the triumphs and victories that we all endured as fans this year. It's amazing to look into the recent past and remember the uncertainty of the Sullivan hiring, the dreadful beginning of the season, and the slumping Cosby period. Then to read about the jubilant acceptance of the brilliant spring streak, the rise of Hagelin, Scuderi packing his bags for Chicago, and eventually winning the fabled Cup. This book has it all as it was frozen in time in complete context and guttural reaction of the people who reported it. I've read through this twice and expect to again shortly. I suggest you snag a copy of your own. SCF Game 6 Recap: Stanley Cup Champions!! !